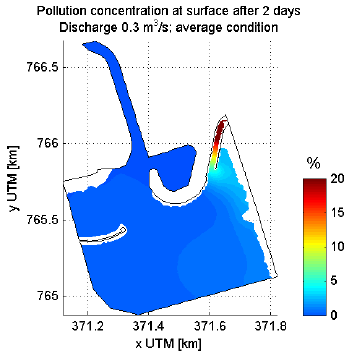 FINEL3D Model, pollution concentration for situation without (left) and with groyne (right). CDR was appointed by the UDA (Urban Development Authority) to carry one of the specific studies for the S-EIA (Supplementary Environment Impact Assessment) for the Colombo Port City project. The study covers the following issues: the description of existing drainage, assessment of environmental impacts on drainage due to land reclamation, mitigation measures and monitoring. The drainage, consisting of about 16 stormwater outlets, and the outlet of the Beira Lake immediately south of the new development site are discussed. The discharge of the outlets is calculated for different rainfall scenarios. For the Beira Lake the water quality is considered and a 3D numerical model is used (SVASEK) to quantify the impact on dispersion into the sea. 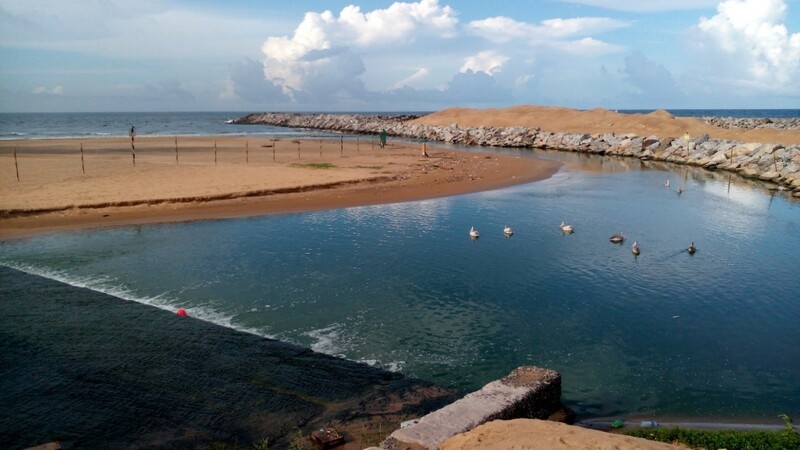 Based on the analysis, as mitigation measure a groyne is included to keep the outlet open from sedimentation and to bring the water further into the sea to avoid any stagnant water or significant impact on the water quality. For the stormwater outlets three mitigation options are proposed: infiltration into the ground, connect the outlets in the future to the new storm water system of Port City or diversion through a drain to the sea or canal. To clarify the S-EIA and respond to any questions, CDR assisted the client for presentations at the TEC (Technical Evaluation Committee) and the CCD (Coast Conservation Department). Beira Outlet channel forming estuarial conditions, attracting fish and water birds.